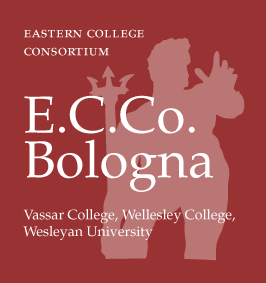 Vassar College, Wellesley College, and Wesleyan University offer a study abroad program at the University of Bologna in Italy. The program is committed to high academic standards and to providing opportunities for students to develop their knowledge of Italian language and culture in one of the most venerable and prestigious academic environments in Europe. Undergraduates wishing to study humanities, sciences and social sciences may enroll for the fall or spring semester or for the full academic year. Students who enroll for the full year or for the fall or spring semester and who have at least an intermediate knowledge of Italian will complete two regular university courses at the University of Bologna, as well as take courses in language and Italian studies offered by the program. The program accepts no more than 35 students from consortium institutions and from other colleges and universities. The program is open to sophomores, juniors, and seniors with the equivalent of at least two semesters of college-level Italian for fall semester or full-year entry and at least three semesters of college-level Italian for spring semester only. An intensive language and orientation program (mandatory for students with less than four semesters and optional for those who have completed at least four semesters of Italian language) is offered in Lecce in August prior to the beginning of the fall semester in Bologna. A wide range of courses in all disciplines at the University of Bologna is available for students with at least two full years of college-level Italian. The program arranges a selection of humanities and social science courses in Italian studies for its participants. An extensive program of cultural events, volunteer activities, and short internships is designed to use local resources and thereby enhance students’ experiences in the community. Accommodation is in student housing arranged by the program.